The Royal College Social Services League was established in 1921 under the paternity of Mr. Victor Perera a teacher of the College during the period of Major. H.L. Reed as Principal. J.R. Jayawardena, Niel Sansone, C.E. Jayawardena, Stanley Soysa, Shirley Corea and a few others had volunteered to nurse the new born baby. These energetic nurses, who late in life reached greater heights of eminence in different walks of life , did their nursing so very well that the new born one was the “Social Services League” itself and reached its full maturity breaking records of evolution. The idea of forming the Royal College Social Services League was first suggested when a holiday camp was set for the Royal College students at Trinity College, Kandy in April 1921. They were most impressed by the good and useful work done by the Trinity College Social Services League. So it was decided to start the Royal College Social Services League in May 1921. The League first ran on the similar lines as the Trinity College Social Services League, but had soon evolved its own scheme of work and made itself a strong body of enterprising and energetic young ones dedicated to serve the under-privileged. Since then the Royal College Social Services League has been one of the most active Club among Royal College, always seeking to help the needy community. The Society celebrated its Golden Jubilee in 1971 in grand style. Following are the details of the Vice Presidents & Secretaries of the society until 1971. This is one of the Major and Daily duties that the League does. By this, we give our service not only to College students but also many students all around the country. The League, through the Book Shop has given the opportunity to the science students to buy their past paper books at a reasonable price. Without any hesitation, we can say that these past paper books of the League have the lowest prices in the country. It is a pride to say that 98% of Science A/L students in the Colombo District use these past paper books of the League. The Bookshop of the Social Services League keeps open in all School days during the interval and after school. Out of the Community Development Projects, this has become a Major project and it has been proven by the people who came from Anuradhapura, Galle, Kandy and so many parts of Sri Lanka to the Royal College Social Services League Bookshop, just to buy books. We have a big responsibility as many students of the College use these pedestrian crossings. Up to now, we have done this in our level best and in all school days, we pay our fullest attention to this. This is also a thing that the members of the League show their commitment and courage. In all school days, all the members of the League come to College at 6.30 a.m. and they spend a whole one hour until 7.30 a.m. in the road, controlling traffic. As a project, this is unique. This is a project that all the members of the League participate in all school days. Through these traffics controlling duties, we have expanded our community services to an unlimited extend. One of the main projects in the calendar of the Social Services League is the “Wesak Mal Ha Bath Dansala” which has been organized for the last 26 years. Flowers, rice packets, Drinks and “Bana poth” are given to the people who come to observe “Sill” at the Kaleniya Raja Maha Viharaya. In making this project a success funds were collected by the students and the teachers of the college and nearly 6000 children and most of the teachers contributed. Temple flowers were broken by our members the day before the Dansala and from the funds received we were able to give away 2500 Rice Packets, more than 6000 Flowers, 11 liters of Cordial and 1000 “Bana” books. As a Rural development project the Social Services League Decided to join hands with the College prefects and help the needy people who are in Sumanthipuram IDP welfare center in the Vavuniya District, identifying the facilities needed for the students to continue their education. It was also discovered that nearly 5000 students are facing great difficulties due to non-availability of educational facilities. Going in to this project we had two main goals in mind, to help these poor children who were displaced due to the war by donating them with stationery and bring them hope for the betterment of their mental situation. Funds for this project were collected from the Grade 1 - 9 students. Going on with this project for one week we managed to collect approximately exercise books worth Rs.65,000, pens & pencils worth Rs. 25,000 , Mathematical Instrument Boxes worth Rs 30,000 and Crayons, Color pencils, Erasers n etc worth Rs. 5000 were donated thanks to Grade 1- 9 students cooperation. All the donations were handed over to the prefects after collecting all the aid from the students. 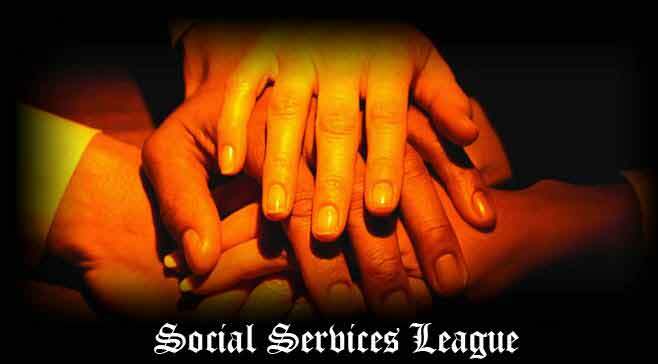 As another Rural Development Project the Social Services League decided to help the needy people who are in Deniyaya. Identifying the facilities needed for the students to continue their education and helping the villages with medical facilities. It was also discovered that nearly 1000 students are facing great difficulties due to non-availability of educational facilities and the villages have to travel far for medication. Going in to this project we had some main goals in mind, to help these poor children who have no way of learning by donating them with stationery and bring them hope for the betterment of their mental situation and organize a Health camp for the villages. Funds for this project were provided by sponsors who were kind enough to help. Nearly 4000 books, 8000 pencil, 4000 erasers, 8000 pens, 4000 rulers and other stationery were distributed and also sports equipments, Musical Instruments and a Computer was donated. The medical health camp was also held in the school premises with specialist doctors from Colombo checking approximately 1500 people around the area and aiding them with medicine as well. The board members of the League agreed that with the situation of the country at this time, more emphasis should be given to Community Service Projects. This did not mean that the League was to do 70 or 80 community service projects but, whatever number of projects we completed at the end of the year would be immensely effective and quality projects with a lasting project. The Social Services League which carries out many Community Services decided to organize a project for a needy Children’s home, “Sanhinda Boys Home colpetty”. In this home of the Orphans we saw that the walls of the building were not painted for a long time and was not a suitable environment to study. So our goal for this project was to paint the home and donate bed sheets, pillow cases and pillows to these needy children. Another Community Development Project was organized at the Saleena Alwis Gunarathna Elders Home, Piliyandala. We offered them lunch, and evening tea with snacks. We were successful to reach our goals and because of it we were able to give them a good mental situation and a peaceful environment to live in. As another Community Development Project we decided to organize it at the Cheshire elders Homes, Mt.Lavinia which lives who are physically and mentally impaired. We offered them with food and drinks. We were successful to reach our goals and because of it we were able to give them a good mental situation and a peaceful environment to live in. Another Community Development Project was organized at the children’s home named Sri Jinaananda Children’s Home Wellawatter. In this home of the Orphans we saw that the walls of the building were not painted for a long time and was not a suitable environment to study. So our goal for this project was to paint the home, refurbish the building and donate C.F.L. bulbs. An Annual Fund Raising Project is organized to collect the needed finances to such Rural and other community developments Projects. The Social Services League in the past have organized musical shows, puppet shows etc so last year we had decided to organize something to do with “Magic”. Since most of the children do like to engage with or watch. Nowadays, Magic has turned out to be something more than extraordinary as it is not functioning properly. Magico Mostrare” – the Magic Show was organized and Sri Lanka’s best performer in the sphere of magic, Mr. Ronald De Alwis was invited to perform. As the main objective of organizing this project was to collect necessary funds for the annual rural development project and other community development projects, we were highly succeeded. The sacred area of the school which is surrounded by the main building is well known by the students as the “Quadrangle”. As the place is daily visited by many students it needed to be renovated and colour washed. Funds for this project were taken from the Leagues savings. The Sacred Bell, walls & Doors were colour washed.